One of the oldest methods used by mothers to transport their babies is to carry them around in an ingeniously knotted, long piece of fabric. It is an ancient tradition, still very much alive in many cultures and societies all over the world. Unborn babies are warm, safe and secure in their mother’s womb, getting a constant supply of nourishment and feeling their mother’s movements. Newborns still have this constant need to be close to their parents and have skin-to-skin contact. Babies have what is termed as ‘skin hunger’. When your child is carried in a baby carrier, he can smell you, hear your heartbeat and feel your body temperature and motions. Carrying your baby in a baby carrier stimulates the hip development, because the baby is assuming the most natural position. Up to the age of three months, the baby is carried in the foetal position, while he keeps his legs pulled up like a frog inside the baby carrier. After three months, the baby can be carried with his legs outside the baby carrier. In that case, the baby sits with his legs spread wide, his spine a little curved and his knees higher than his bum (the M-position).This is the ideal position for the baby’s hip development. Carrying you child in a baby carrier cannot only prevent hip problems, but is also helpful in the treatment of congenital hip dysplasia. The Love & Carry® woven baby wrap is a wrap with a Jacquard weave. Jacquard woven fabric is produced on a special weaving loom fitted with a jacquard patterning mechanism. Woven jacquard fabrics are typically multi-coloured, or figured with intricate and textural designs. They are generally stronger and more resilient than those with basic weaves. A Jacquard baby carrier is very suitable for carrying your precious baby. The Love and Carry® "Sea" is a baby wrap woven in a Jacquard pattern. Weaving a Jacquard pattern is .. The Love and Carry® "Treasure" is a baby wrap woven in a Jacquard pattern. Weaving a Jacquard patter.. 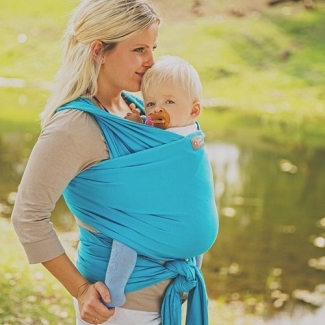 The Love and Carry® "Lagoon" is a baby wrap woven in a Jacquard pattern. Weaving a Jacquard pattern ..